WASHINGTON (CNN) -- U.S. Rep. Joe Wilson -- the South Carolina Republican who heckled President Obama during his speech to a joint session of Congress -- has raised at least $1 million in contributions, a campaign aide confirmed. 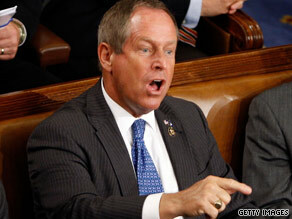 Rep. Joe Wilson, R-South Carolina, shouts "You lie!" during President Obama's speech Wednesday night. News of that cash haul comes after Wilson directly asked in a Web video for campaign cash to fend off attacks from political opponents and said he's standing by his opposition to Democratic efforts at health care reform. Wilson has come under fire for shouting "you lie" to Obama during the Wednesday night address to Congress on health care reform. The lawmaker soon apologized for his behavior, viewed by Republicans and Democrats as an ill-mannered breach of political decorum. The remark energized Wilson's opponents and supporters, who have been opening their wallets and sending donations to Wilson and Rob Miller, his Democratic opponent in next year's congressional race. Miller -- who has reported raking in more than $1 million as a result of the outburst -- ran against Wilson last year, losing by 8 percentage points. It was Wilson's smallest margin of victory in his five elections to Congress. In an e-mail to supporters Friday night, Miller said he had raised the money in small contributions in less than 48 hours -- a total that dwarfs the $67,000 he has taken in during the entire first half of the year. Wilson shouted "you lie" after Obama laid out what the congressman said were "bogus claims" about health care reform "spread by those whose only agenda is to kill reform at any cost." "There are also those who claim that our reform efforts would insure illegal immigrants. This, too, is false. The reforms I'm proposing would not apply to those who are here illegally," Obama said. It was at that point Wilson made his now-infamous exclamation, sparking boos and Obama's retort: "It's not true." In a YouTube video released on Thursday, Wilson said, "On these issues, I will not be muzzled, I will speak up and speak loudly against this risky plan." He added: "Supporters of the government takeover of health care, and the liberals who want to give health care to illegals, are using my opposition as an excuse to distract from the critical questions being raised about this poorly conceived plan."